If you're in the market for a fit-tech device, you have options. There's Fitbit. There's Fitbug. There's Omron, Garmin, Withings, Jawbone, Larklife, Nike+, BodyMedia, Scosche, Wahoo, Movable, and Striiv. And all those gadgets measure steps, sleep, calories, location, laps, altitude, routes, floors climbed, distances walked, activity intensity, body mass, and weight--all in various combinations. The Zensorium Tinké doesn't do any of that. Small, brightly colored, and unobtrusive, the Tinké plugs into iOS devices to measure heart rate, heart-rate variability, blood oxygen levels, and respiratory rates, making it more of a health-tech device than one focused on fitness. It represents a solid attempt at bringing health-focused features and data worthy of sharing with your doctor to a consumer market that loves fitness gadgets. 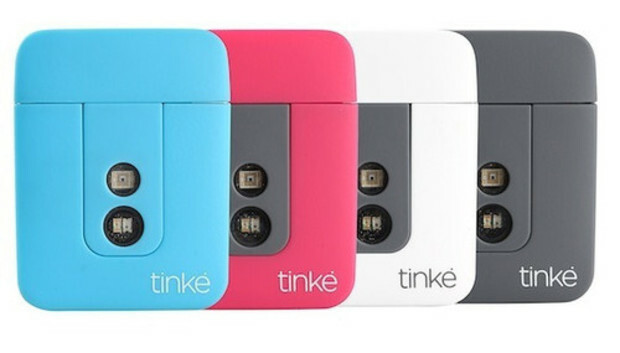 The Tinké--which, despite the accent, is pronounced "tink"--measures 1.6 by 1.3 by 0.3 inches, roughly the size of a box of breath strips, and weighs just 10.7 grams (less than 0.4 ounce), so it's effortless to carry around with you. The front features two sensors, the top comes off to reveal a 30-pin connector, and a thin color-coordinated metallic strip bands the body of the Tinké. That's all there is to it--no batteries, no screens, no chargers, no cables. When you plug the Tinké into your iPhone or iPod, you get a welcome screen that instructs you to log in or create an account. However, it took me a few frustrating attempts to realize that in order to access the menu options, I needed to tap and hold the icon to get the menu to stay visible. Once I got that down, I entered my full name, gender, date of birth, country, email, skin tone (which you have the device measure by holding your thumb over the sensors), and phone number to create an account. Tinké then sent a PIN to my mobile, and asked me to create a user ID and password. Because the Tinké has no screen of its own, you have to rely on the app interface to control the hardware. You'll find tutorials for both of the indexes the Tinké measures: the Vita index and the Zen index. Measuring either index requires you to press and hold your thumb over the sensors on the front of the Tinké for a timed period (about 60 seconds). To take the Vita measurements, you first select the V icon from the bottom navigation row (again, you need to tap and hold the V, and then slide your finger up to the Measure VITA menu option). The Tinké instructs you to connect the hardware if you haven't already done so, and then blinks red. When you place your thumb over the sensors, the Tinké displays a screen with waves that indicate how hard you're pressing on the device. Underneath the waves is a bar timer; above the waves are helpful and encouraging tips. When you've finished, the Tinké displays your overall Vita score out of 99 possible points, as well as data on your breaths per minute, heartbeats per minute, and oxygen level (as a percentage). The Tinké ranks your score--58, for example, is Acceptable--and lists your confidence level. Apparently, 58 proves that I have high confidence. Below the health data, the Tinké provides information on what the data means. For example, for my 58 Vita score, the Tinké told me "Your heart rate is really fast. Try getting a good rest or sleep, slow down your pace, and take deeper breaths." To the right of the explanation is a gray arrow; tapping and holding the arrow gives you the option to discard the score, retry the measurement, or save. If you elect to save the index, you get further options to add a note, to "Shout!" your results (and optionally share them on social media), or to finish by tapping Done. The app then takes you to an overall Vita measurement page (MyVITA in the menu), which shows your results over time, provides data on the Vita Science, and offers a tutorial. The other index the Tinké measures is the Zen index, and you access it in a similar manner as you do the Vita, by holding down the Z icon and selecting the Measure Zen option. The Zen index also has a bar timer running along the bottom, but instead of waves it displays five circles that expand and contract. The idea is that you try to follow these circles with your breath, an exercise intended to encourage you to take slower and deeper breaths. The Zen index also shows you a score out of 99 possible points, and gives an indication as to what type of mood your score shows you to be in. For example, I got 50, which is "Calm." Again, an encouraging note appears at the bottom ("Doing well. Keep calm and carry on practicing your breathing to improve.") and a gray arrow shows up for you to discard, retry, or save. As with the Vita index, you can add a note, Shout your results, or finish, after which the Tinké takes you to a MyZEN page with similar Science and Tutorial options. The other selections in the app are My Wall, which displays Shouts and friends, a graph icon that leads to Achievements and History, and a personalized home page that displays your most recent Vita and Zen scores, a helpful tip about the Tinké along the bottom, and a general health tip at the top, as well as links to Settings, friend requests, and Shouts. Overall, using the Tinké is interesting--the Zen index test feels like a nice, brief bit of meditation, while the pieces of data on heartbeat and breath rate in the Vita index are interesting to note. The Tinké encourages you to take at least three measurements a day. However, during the second and third daily measurements, I often encountered some snags: The Tinké wouldn't register or read my thumb, and would then get stuck on a screen requiring me to disconnect the device and start over. The Tinké does require darkened conditions, and occasionally putting my hand under my desk would help it get a reading. Trying to get the readings right was a bit frustrating. Another issue I ran into was the nature of the data itself: Although it's illuminating to know my number of breaths and heartbeats per minute, I often found myself wanting more explanation of what the scores really mean, the Vita score in particular. Were my 58 score and high heart rate due to my being a bit under the weather? Are they an indication that I need to exercise more? To drink more water? How do other people in my general range measure up? Both the Science sections of the index pages and Tinké's website offer some additional information, such as "A low resting heart rate usually indicates better fitness," but I still felt myself wanting more detail. In contrast, fit-tech devices are often data-driven, and hence heavy on providing a range of data across the board. For example, the Fitbit Flex tracks and charts your steps taken, calories burned, hours slept, distance traveled, minutes active, and quality of sleep. But the Tinké isn't a Fitbit, and that's not what it's designed to do. It's designed to simply and cleanly measure four metrics about your breathing and heart rate. And it does so with a relatively uncomplicated interface and an easily portable bit of hardware. However, it's probably a lot more useful for people who already have a grasp on what breath and heart-rate measurements indicate about their actual health. Those people who have issues with their respiratory or cardiovascular system, for example, would likely find the device and the data very helpful. Although the Tinké provided me with some interesting information, I never felt as though it were a device that gave me actionable information about my fitness, so much as about my health. In the end, I think its strengths don't lie in competing with the Fitbits and Fitbugs and Withings, but in focusing on health features and making them available in a way that no other product has so far.